When? 2015-16 | What’s it rated? NR | Where’s it available? Streaming on Amazon. Some 50 years ago, my name might not have been printed under this article because as a woman in a newsroom, I’d only have been allowed to rise as high as a researcher—or as a female, I simply wouldn’t have been hired, period. In 1969, while a cultural revolution swept through the country, many newsrooms remained stuck in the past, with women doing all the research and work under male reporters and getting none of the credit. This struggle is perfectly captured in Amazon Prime’s original show Good Girls Revolt, based on the book of the same name by Lynn Povich. The story is based on true events and harks back to a time when the now late and great Nora Ephron (played by Grace Gummer) starts her career as a researcher at News of the Week (Newsweek in real life), but quits shortly after the magazine refuses to publish her article under her own name. This lights a fire under the ladies left behind at News of the Week, from the tenacious, freewheeling researcher Patti Robinson (Genevieve Angelson) to the initially mousey caption writer Cindy Reston (Erin Drake), to even straight-laced Jane Hollander (Anna Camp) who typically plays by the rules and comes from a family with money and expectations. After attending a meeting of like-minded ladies, the girls from News of the Week start to work with a badass lady, African-American lawyer Eleanor Holmes Norton (Joy Bryant) from the ACLU, to file a formal complaint on workplace discrimination that could lead to a bona fide lawsuit. 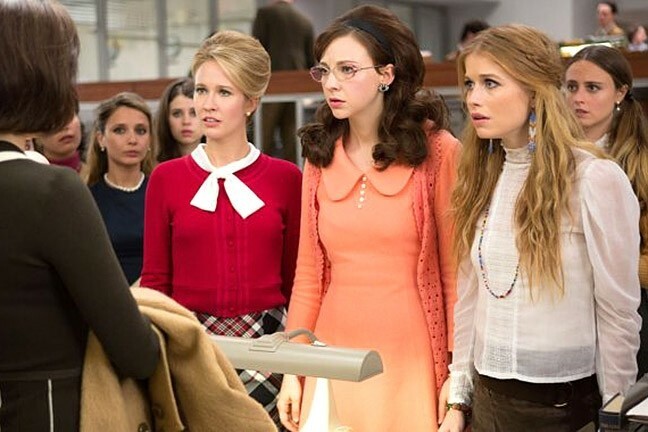 FIGHT TO WRITE: In Good Girls Revolt, the women of News of the Week, are spurred to take legal action to be hired as reporters and editors when Nora Ephron (Grace Gummer) quits in protest of sexist practices. But Good Girls Revolt is so much more than a history lesson. It does for journalism what Mad Men did for advertising. It busts the whole operation wide open, and the guts and blood ain’t so pretty. Sure there are the fun swanky dresses and hairdos of the time, and pencils are always being sharpened and groovy records playing while some editor pours a drink in the office, but the show gets to the heart of the matter: These are real women leading this revolution. Cindy is stuck in a loveless marriage, with a husband who’s poking holes in her diaphragm. She thinks she’s found solace in the charismatic photo editor Ned (Michael Oberholtzer), but things don’t pan out. Meanwhile Patti struggles with working under her boyfriend Doug (Hunter Parrish) while dying to be a reporter herself. When Jane tries to pitch a great story idea to one of the editors, she’s rewarded with their giving it to a freelance writer and, oh yeah, Jane gets flashed by said editor. Meanwhile the sole female African-American researcher has to put up with unwanted physical attention from her reporter, and a pregnant receptionist who already has three kids drinks some kind of tincture to induce abortion because she can’t get legal medical help and can’t afford another kid. And after the magazine sticks its neck out to write a progressive piece about the Black Panthers, the writer on the story, Doug, is assaulted in a black alley by police officers. And, of course, the women find out they’re making about a third of what the men make. So let’s see, we’ve got sexism, the wage gap, women not having control over their own bodies, racism, and retaliation from government officials for the media exercising its First Amendment rights; … that foggy feeling of deja vu is washing over me. Is it 2016 or 1969? There are only 10, 50-minute episodes of Good Girls Revolt, and I suggest you gobble them all up over the long Thanksgiving weekend.